Email us if you're interested in future screenings! 16 Exhibitionists and two Italian filmmakers take on the NYC art world! 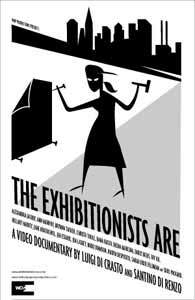 Luigi Di Crasto and Santino Di Renzo of Without Papers Productions began filming The Exhibitionists during their 6-week collaboration for the Exquisite show at Naked Duck Gallery in the summer of 2003. The two Italian filmmakers followed the Exquisite collaboration process, filmed the opening night of the show, and subsequently interviewed 16 individual members over the course of two years. In addition to the 30 hours of material they filmed, Santino and Luigi pored through The Exhibitionists archives to collect photos, slides and other video footage that would help tell the story of the last five years of this group. The Exhibitionists Are features 16 members of The Exhibitionists, and focuses on their experiences and struggles with being visual artists, writers and performers in New York City. The Exhibitionists work together as independent artists to unite the visual, written and performing arts, and to host monthly salons in pursuit of fresh dialogue about the arts.